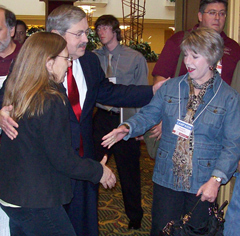 Terry Branstad and wife Chris greeting people prior to the IBNA debate May 1. Former Governor Terry Branstad will return to the campaign trail today, just a couple of days after his doctors put a new stent in his heart. Branstad, a candidate for the Repubican Party’s 2010 nomination for governor, is scheduled to appear in Marion at 10 o’clock, then Branstad and his family will visit Pella during the town’s “Tulip Time” festival. This evening Branstad will be in Okoboji for a Dickinson County G.O.P. event. “I’m not his doctor, but his doctor indicates that he’ll be very capable of performing the functions of a candidate and of a governor,” Gross says. Gross made his comments on the Iowa Public Television program, “Iowa Press.” The show’s other guest was Des Moines attorney Jerry Crawford, a Democratic Party insider. Crawford said Branstad’s health won’t be a help or a hindrance to his campaign. Crawford, who is 60, was at Churchill Downs for the 2007 Kentucky Derby when he suffered a heart attack. Doctors in Louisville put three stents in his heart. Branstad had a heart attack in December of 2000 and had a stent inserted back then. The former governor, who is 63, had a stress test this past Wednesday, doctors diagnosed a blockage and inserted a stent.